There is dying for your art, and then there is waking up during night’s darkest hour to produce your art. Those who hit up Amazing Glaze Donuts at 215 E Cedar St. in Pocatello at its 6 a.m. opening time are among the first to witness the reward of suffering for your art with its wafting sugary aromas, the gem-like donuts nestled behind their glass cradle, and the wall of skyscraping pink donut boxes behind the counter that epitomizes what Amazing Glaze is all about: donuts. 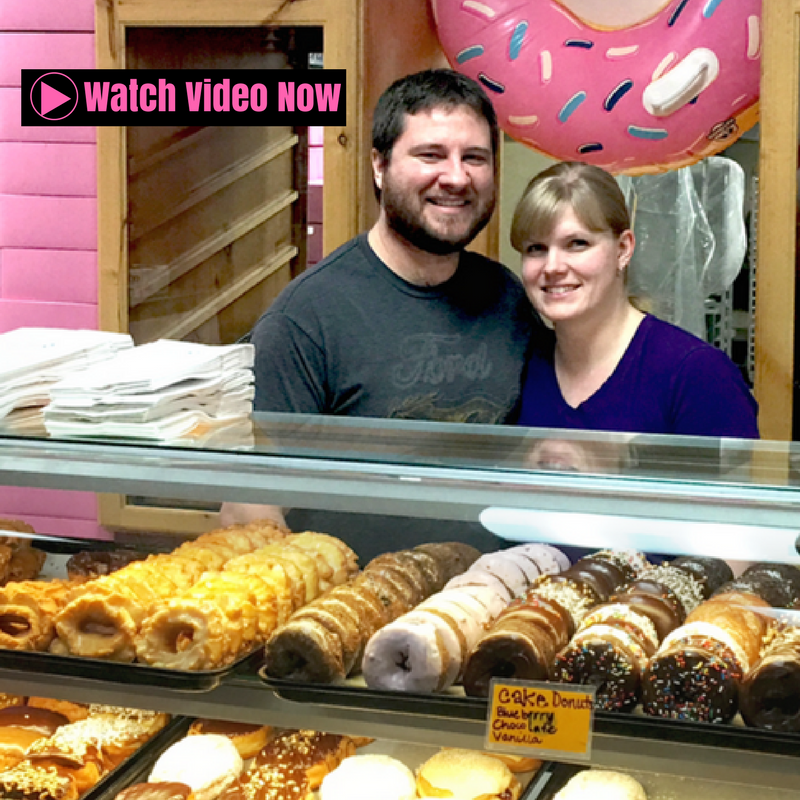 Dean and Katie Giesbrecht, the owners of Amazing Glaze, and their employees, Michael and Marianne, make between 1,400 to 2,500 donuts per day from scratch. This is roughly 400,000 calories of savory treats being distributed to the Pocatello community daily. Yet the Giesbrechts, who opened Amazing Glaze Donuts’ (formerly known as Double Shot Donuts) doors in August 2017, are relatively new to the art of making donuts. Dean’s desire to own a business has surged strong since he was 18 years old, and luckily, it was Katie’s association with Bob and Heather Ross, the previous owners, that got their foot in the door. Working as a barista for Double Shot Donuts, Katie cultivated her boss’s business savvy. This wasn’t the first time that the Giesbrechts have tried to start a business, either. The stars aligned above the donut shop as well as within the kitchen. Locals and donut-lovers would be surprised to learn that one of the ingredients the Giesbrechts use in one of the donut recipes is also a staple at dinner: mashed potatoes. Each week, the Giesbrechts hand peel, boil, and mash 500 pounds of potatoes from GPOD in Shelley, Idaho. These mashed potatoes are then mixed with potato flour and real flour to create the fluffy sweetness of the donut dough. “It’s funny because we get to tell people, ‘Hey, you’re getting your vegetables today,’” Dean said with a laugh. Before the Giesbrechts got potatoes from GPOD, they got them from the cellar from an Aberdeen farmer. But in some cases, they got them straight from the field. During Amazing Glaze’s opening week, the potatoes weren’t yet crated, so Dean and Katie loaded their children up and they hand-dug potatoes for three hours. This work, along with the daily tasks of owning a donut shop, is something that the Giesbrechts are glad their children are experiencing. They are grateful for business consultant Claudia Allen of the Idaho State University Small Business Development Center, who has guided them through small business technicalities. Within the walls of Amazing Glaze, the Giesbrechts also recognize that a business’s continual success is a combined effort of all those who work within it. On a regular basis, there are 28 different varieties of donuts devoured by customers, such as peanut butter and jelly-stuffed donuts, tiger tails swirled through with cake batter, raspberry fritters, and even fruity pebbles sprinkled over a glazed icing. While Amazing Glaze blooms with this abundance of variety, the Giesbrechts also have ideas stirring in their mind that could add more meal-oriented delights to the menu. These include kolaches, which are breakfast pastries loaded with ham, cheese and potatoes, and apple bombs, which are donuts packed with cooked apples. They are also plotting out if they could keep the shop open for lunch and sell bread bowls with white chicken chili and other savory concoctions. With all these tempting treats available to the public, sometimes Amazing Glaze sells out before closing time. 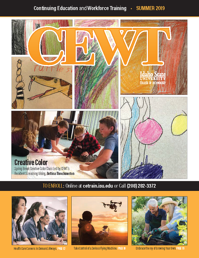 CEWT is interested in supporting workforce development, and provides small businesses and entrepreneurs with opportunities to get their story out there. For more information, visit cetrain.isu.edu or call 208-282-3372.